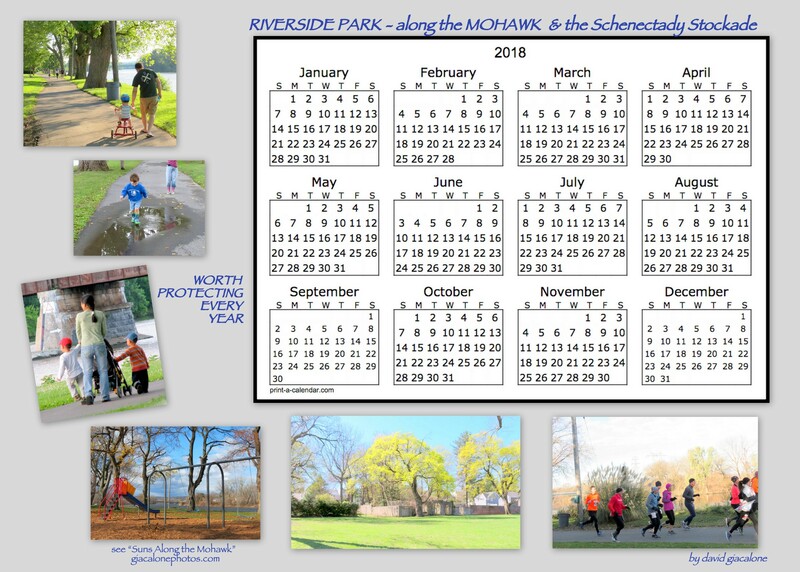 Christmas, with the late-December Holiday Season, seems to be coming quite quickly this year, and before it arrives and our focus is elsewhere, I want to thank all those who have visited “suns along the Mohawk” in 2017 — with additional, special appreciation for those who have worked to make the Stockade a special place to live and visit, and those who have expressed their appreciation for this site. 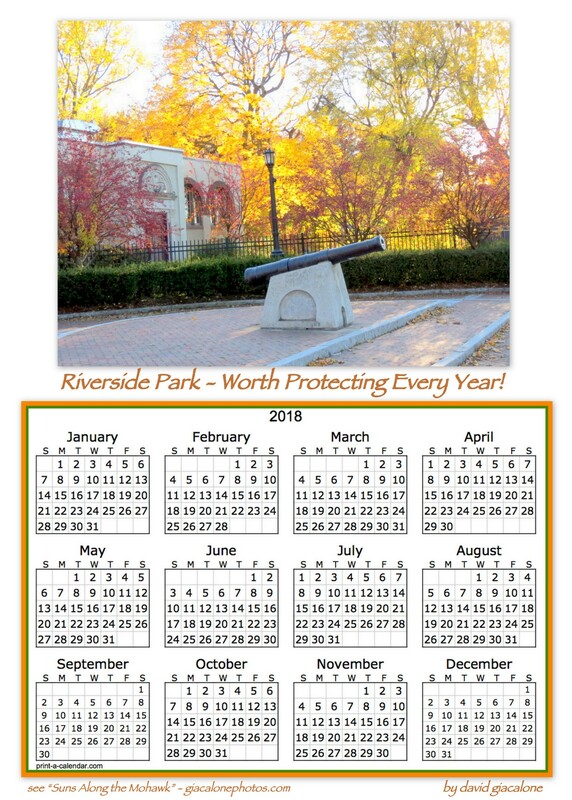 As a small token of my thanks, I’ve put together a number of Riverside Park one-page 2018 calendars for your enjoyment, use, downloading, printing, etc., for your noncommercial use. Each is formatted for 5″ x 7″. 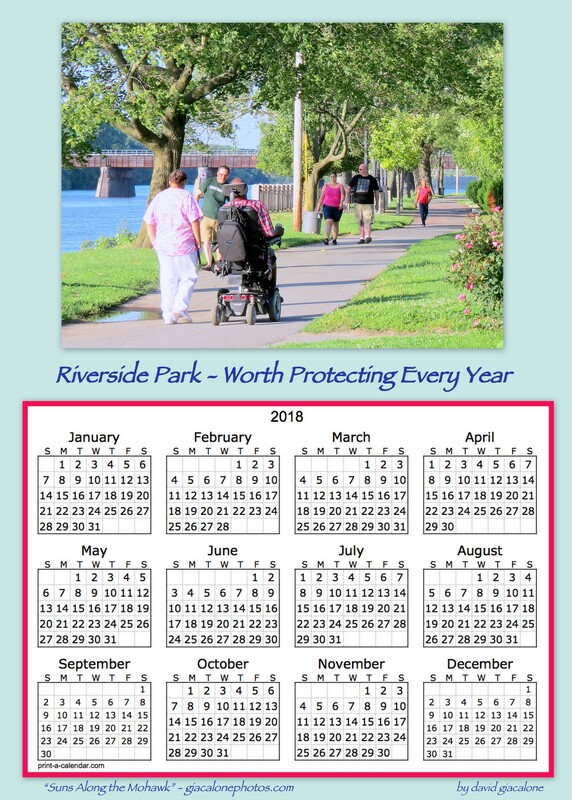 Click on a calendar to see a larger version and access the jpg. file for downloading. 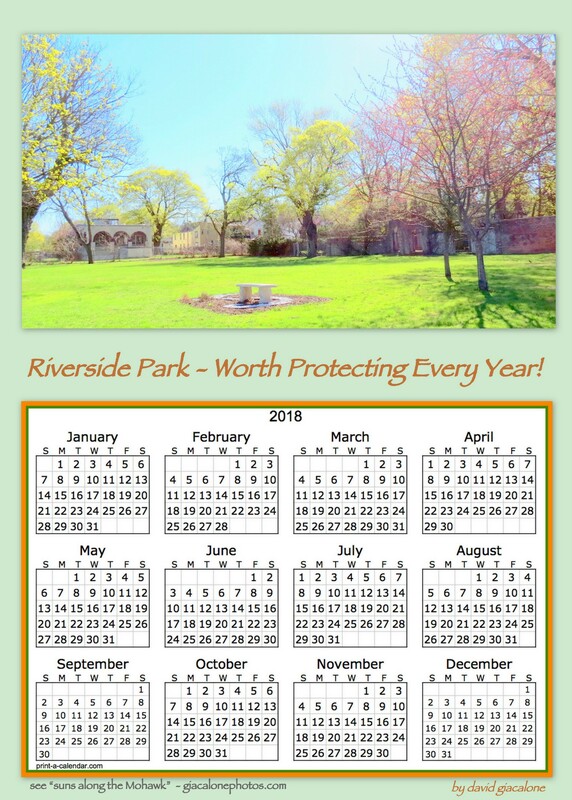 . . Wishing all a joy-filled and safe New Year . .
Our very special neighborhood park deserves and requires our vigilance. That might be why we have that cannon at the end of North Ferry Street. 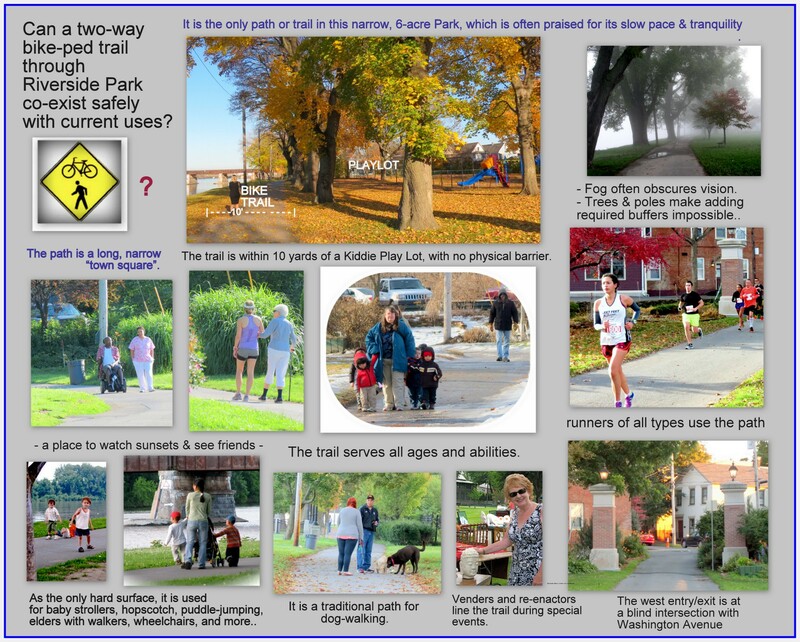 We want to preserve what makes it so special, for everyone who loves and enjoys it or will in the future, and not — as some Schenectady officials have stated in public — to keep it only for the people of the Stockade. 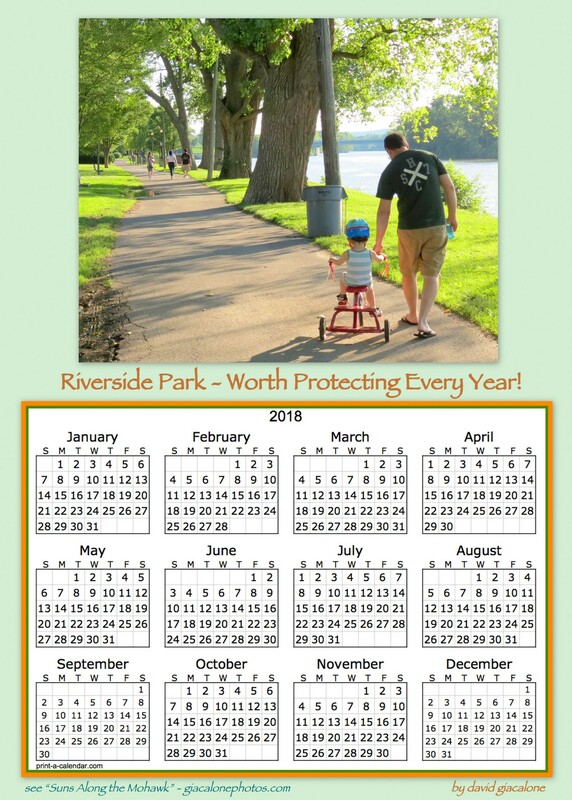 Some other danger may appear on the horizon, but the most important looming battle, in my estimation, is to ensure that the recently adopted Bike Schenectady Master Plan does not diminish the safety or enjoyment of its sole walkway for the many types and generations of current users. For a detailed analysis click here.